Ribs are less highly prized than tenderloins or steaks. Yet when cooked correctly, they can be as tender and juicy as more expensive cuts. They are also a crowd-pleasing main dish perfect for summer parties or game days. Here’s an introduction to pork and beef ribs. Ribs need to be cooked low and slow. This can be done in the oven, on the grill or in the slow cooker (see “Different Methods for Cooking Ribs” for more detail). All three methods will yield delicious results, so choose the method based on the amount of time you have (the slow cooker can work while you are away), the time of year (not every climate is friendly to winter grilling or smoking), and quantity of ribs you will cook (slow cookers can only hold so much). Spare Ribs come from the front of the pig’s rib cage. They are fatty, flavorful and meatier than loin back ribs. There is about a serving to a serving-and-a-half per pound. Loin Back Ribs or Baby Back Ribs come from the back end of the pig’s rib cage. The meat is typically leaner and more tender than spare ribs. Back ribs are smaller, thus, the name baby back. Their smaller size helps them cook faster. There is about a serving to a serving-and-a-half per pound. Country-Style Ribs are actually not ribs. The meat comes from the shoulder or loin area of a pig. Country-style ribs can be cooked in the same manner as spare ribs. There are two to three servings per pound of country-style ribs. Beef ribs are delicious braised, a method of cooking in liquid in the oven. They are also great grilled and served with barbecue sauce. Beef ribs come from the same part of the cow as prime rib roast, so the meat is of high quality, although cooking beef ribs takes more time than cooking a steak. Low and slow cooking is also the best method for cooking beef ribs. Beef Short Ribs come from the bottom part of the rib cage. The meat is on top of the bones. It is less tender than meat from the back ribs. It is best to grill or braise beef short ribs. This cut is very bony, which means there is only about a serving to a serving-and-a-half per pound. Beef Back Ribs come from the top of the cow’s rib cage. The meat contains lots of marbling – little streaks of white fat – which makes the meat tender and juicy. This cut of meat contains fat in between the ribs but not on top. It is a great meat to braise, because so much flavor comes from the bone marrow. Grilling is another common way of preparing this cut. Below are some keys to successfully making ribs. It’s important to remove the membrane (called silverskin) found on the side of the rack of both pork and beef ribs where the bones are most visible. Taking this step allows you to remove excess fat, which makes the meat easier to eat. It also improves flavor as your spice rub or marinade can adhere to the meat. The silverskin is easy to remove, just follow the instructions below. Slide knife under silverskin; lift and loosen until you can grab it with a paper towel. Pull the membrane off in one piece, if possible. Remove any fat pockets beneath. Before you begin cooking ribs, you will want to know the three fundamental approaches for how to season ribs. When making pork ribs, you will want to know how to dry rub ribs and how to glaze ribs. When cooking beef ribs, you will want to know how to brown ribs. A simple way to add more flavor to ribs is by applying a spice rub before cooking. Here’s how to add a rub to your ribs. Dry the meat with paper towels. Brush on a “slather,” or coating of mustard, honey or other liquid, to both sides of the ribs. This is an optional step that some people take to help the spice rub adhere to the meat. The slather itself typically doesn’t add a lot of flavor, because ribs cook for so long that the flavor will fade. Coat both sides of the ribs with the spice rub. For other flavor profiles, try a Cajun Spice Rub, a Southwestern Rub or our 4.5-star recipe for Slow-Cooker Caribbean Spiced Ribs. Ribs cook for a long time, which is why you don’t initially apply a glaze or sauce, especially one that is tomato-based or contains a lot of sugar, like barbecue sauce. If applied too early, the glaze or sauce will burn, so here’s how to add sauces or glazes. Cook your meat as directed in the recipe. 30-60 minutes before removing the ribs, apply the glaze or sauce. If cooking for only another 30 minutes, turn up the heat. If cooking for another 60 minutes, keep the heat low. Here is a classic recipe for Barbecued Ribs or, for a twist, try the Grilled Baby Back Ribs with Spicy Barbecue Sauce. Heat a pan on the stove over medium-high heat. When the pan is hot, add 1 tablespoon of an oil with a high smoke point, like canola. When the oil shimmers, add the ribs. Cook for a few minutes, checking frequently. If the meat is sticking to the pan, it is not done searing. When you can lift the meat relatively easily – you might loosen it with a spatula – flip the ribs. Sear the other side of the ribs. Try browning for yourself by making our recipe for Beef Short Ribs Carbonnade. A perfect place to begin cooking ribs is with our recipe for Beef Short Ribs with Tomato Wine Sauce. This impressive meal is actually super simple – see for yourself with our step-by-step guide. 1. Before beginning, cut the ribs into separate pieces and remove any excess fat. 2. Heat the oven to 325°F. In a 12-inch skillet, heat oil over medium-high heat. Cook the ribs in oil for 7 to 9 minutes, turning frequently, until brown on all sides. 3. In ungreased 13x9-inch (3-quart) glass baking dish, mix the tomatoes, broth, wine, chili sauce, salt and pepper until well blended. Add the ribs, onion and garlic; stir gently to mix. (Baking dish will be full.) Cover with foil. 4. Bake 2 hours 30 minutes or until the ribs are tender. 5. Remove the ribs from the baking dish; cover to keep warm. 6. Skim fat from sauce. 7. Serve ribs with sauce. This dish goes perfectly with our recipe for Silky Garlic Mashed Potatoes and Browned Butter Carrots. Here are the basics of cooking ribs, including how to roast ribs in the oven, how to grill ribs, how to make ribs in the slow cooker and how to smoke ribs. Roasting is a great method for cooking ribs. Roasting simply means cooking in the oven, uncovered and without liquid, at a constant temperature throughout the cooking process to achieve juicy, evenly cooked meat. In order to achieve the best results, here’s how to roast ribs in the oven. Let meat stand at room temperature 15 to 30 minutes before roasting. Place ribs meaty side up in a roasting pan or into 13x9-inch pan with a rack fitted inside, so fat can drip away into the bottom of the pan and be drained away later. Roast at the best temperature for the cut – see below for temperatures associated with different types of ribs – until the meat shrinks and more of the bone is exposed. Remove the ribs from the oven; cover loosely with foil and let stand before carving. Bake covered 1 hour 45 minutes; brush with sauce. Bake uncovered about 45 minutes longer, brushing frequently with sauce. Heat remaining sauce to boiling; boil and stir 1 minute. Bake covered 1 hour 15 minutes; brush with sauce. Bake uncovered bout 45 minutes longer, brushing frequently with sauce. Cover; bake about 2 hours; drain. Pour sauce over ribs. Bake uncovered 30 minutes longer. Pour sauce over ribs. Cover; bake about 2 hours 30 minutes. Spoon sauce from pan over ribs. For step-by-step instructions, see our article about cooking baby back ribs in the oven or try our long-cooking recipe for Beer-Braised Short Rib Dinner. Grilling is a perfect way to cook ribs. You get irresistible smoky flavor, and you don’t have to heat up your house on hot summer nights. In order to grill ribs successfully, here’s what you need to know. When you are cooking food for more than 25 minutes on the grill, you need to set it up for indirect heat. This means positioning the meat in the center of the grill so the heat comes from the sides. Follow the directions below to set up your grill for indirect heat. Move hot, white coals to edge of firebox, leaving area in middle free of coals. Place drip pan in the open area. Grill food over drip pan. Heat all burners on high for 10 to 15 minutes. Turn off center burner and place drip pan in center. Adjust temperature of ignited burners as needed. If grill only has two burners, turn off one and set drip pan on that side. Don’t line the bottom of the grill with foil because grease needs to drain into the catch pan under your grill. Quickly move food to a different area of the grill rack and cover the grill. For a charcoal grill, spread coals farther apart or, if necessary, remove food from the grill and spritz the flames with water from a spray bottle. When flames are gone, return food to the grill. •	For a gas or electric grill, turn all burners off. Never use water to extinguish flames on a gas or electric grill. When flames are gone, light the grill again. If you are using a barbecue sauce or other sugary or tomato-based sauce, wait until the last 10-15 minutes of cooking to brush it on. This will prevent the sauce from burning and potentially causing a flare-up. This will help you avoid any potential flare-ups next time. After cooking on a gas grill, turn the heat setting to high for 10-15 minutes to with the cover closed. This burns off any residue on the grill rack and lava rock or ceramic briquettes. Clean grill rack with a brass bristle brush after each use. Try this cooking method for yourself with our recipe for Grilled Ribs with Cherry Cola Barbecue Sauce or for a twist on tradition try, Grilled Pork Ribs with Chipotle Barbecue Sauce. Smart Weeknight-Cooking Tip: Grill Ribs in 45 Minutes! If you are in a hurry, try the combination cooking method used in our Back Ribs with Sweet-Savory Sauce recipe. Simmering the ribs on the stove first shortens the amount of time the ribs need to be on the grill without sacrificing the great smoky flavor that comes from grilling. The slow cooker is a great method of cooking ribs because it’s an easy and safe way to cook meat at a low temperature for an extended period of time. Most slow-cooker rib recipes will call for braising or cooking the ribs in liquid. This is a perfect way to cook ribs on a busy weekday or on a Sunday game day when you want to serve up an easy, crowd-pleasing meal. Here’s what you need to know in order to cook ribs in the slow cooker. Slow cookers heat up more slowly and cook at lower temperatures than most other cooking appliances, so for food safety reasons, it’s important to let ribs thaw completely before cooking. For easy clean up, spray the slow cooker or use a liner. Most slow cookers are not large enough to accommodate a full rack of ribs, so check your recipe before going to the store. This way, you can ask your butcher to cut the ribs into the section sizes specified in your recipe, saving yourself some knife work. Keep in mind that slow cookers work most efficiently when they are two-thirds to three-quarters full. Exact cooking time will vary by recipe, but typically slow-cooker rib recipes require 6 to 8 hours on low. Resist the urge to lift the lid until the recipe specifies. Removing the lid lets steam escape, adding 15 to 20 minutes to the cook time. Generally, slow-cooker rib recipes will have you dump out the cooking liquid when the ribs are nearly done. Then, you will return the ribs to the clean crock, add the sauce and cook for another 30 to 60 minutes. Try making country-style pork loin ribs in the slow cooker with our can’t-fail, 4.5-star recipe for Slow-Cooker Polynesian Pork Ribs or, for a classic take on barbecued baby back ribs, try our recipe for Slow-Cooker Barbecued Baby Back Ribs. Smart Weeknight Cooking Tip: Stash Make-Ahead Ribs in Your Freezer! For those nights when you just know it’s going to be impossible to get dinner on the table, here’s the recipe you need. Slow-Cooker Asian Beef Short Ribs can be prepped up to three months in advance. When you’re ready to cook them, just pull them out to thaw in the fridge and dump them in the slow cooker before you head out the door in the morning. They’ll be ready in time for dinner that evening! Smoking is a an almost effortless style of outdoor cooking that doesn’t require frequent tending, turning or basting and infuses an unforgettable flavor into every bite. It’s a perfect method for cooking ribs because it is a slow process that tenderizes the meat by cooking it in a dense cloud of smoke and steam, infusing the characteristic flavor, moisture and tenderness smoked meats are known for. It’s important to follow the manufacturer’s directions when using a smoker to ensure safety. Here are some other tips to keep in mind. Use only completely thawed meat because the heat inside the smoker is too low to thaw and cook frozen food safely. It’s best to smoke food when the outdoor temperature is 65°F or higher and there is little or no wind. Below, 55°F, the smoker and food will not get hot enough and may result in an additional two to three hours of cooking. Monitor the temperature inside the smoker with an ovenproof meat thermometer to ensure the heat stays between 225°F and 300°F throughout the cooking process. To gauge the temperature of the food, use a digital oven-cord thermometer. It can stay in the food in the smoker and sounds an alarm when the food has reached the correct temperature. Using an analog ovenproof thermometer is another option; however, you must lift the cover to check for doneness (at the minimum time given in the recipe), which releases heat and increases the cooking time. Note that some smoked foods will remain pink even when fully cooked, so using a thermometer to determine doneness is very important. 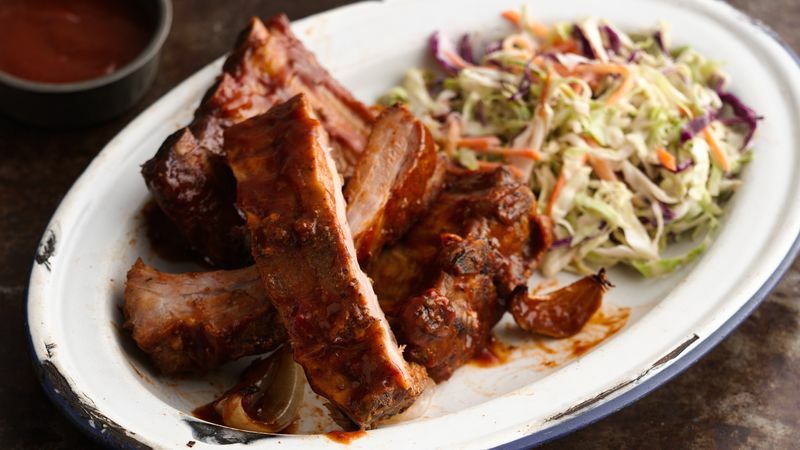 Try smoking pork spare ribs with our recipe for Hot & Spicy Ribs. If you have a grill but want smoked flavor, here is how to do it. Cover 1 to 2 cups wood chips or shreds, or two or three wood chunks with water, and soak at least 30 minutes; drain. Put soaked wood onto a piece of heavy-duty foil; seal tightly to form a pouch. Poke 6 to 8 slits in top of pouch with a sharp knife. Put pouch on grill rack or follow manufacturer’s directions for adding wood chips. Cover grill and let pouch get hot enough to start smoking, about 10 minutes. Put the ribs on the grill, leaving the pouch in the grill during cooking. Here are some of our favorite sides to serve with flavorful ribs. Barbecued ribs are always so crowd-pleasing that you hardly need to serve anything more than a big slice of watermelon alongside them. If you want to serve a hearty meal, we recommend cooking up a few of these classic sides. Beef short ribs make an elegant and warming meal, perfect for company. If you are looking for classic pairings, try a few of the side dishes below. Follow the advice below when buying ribs. Check your recipe before leaving home so you can ask your butcher to cut ribs into pieces for you. If you have to cut ribs yourself, use a sharp knife or kitchen scissors. When buying ribs, look for “shiners” or exposed bones. If too much meat has been scraped off the bone, obviously there is less to eat, so it’s best to avoid buying racks with shiners. Choose packages without any tears, holes or leaks. There should be little or no liquid in the bottom of the tray. Packages should be cold and feel firm. Avoid packages that are stacked too high in the meat case because they may not have been kept cool enough. Check the sell-by date and use within two days of that date. Put packages of meat in plastic bags before putting them in your grocery cart. This way, any bacteria in the juices won’t drip on and contaminate other foods, especially those that won’t be cooked. Don’t buy or use meat that has turned gray or has an off odor. Refrigerate meat as soon as you get home from shopping. If it will take longer than 30 minutes to get home, keep meat cold in a cooler with ice packs. Here’s what you need to know about safely and efficiently storing uncooked and cooked ribs. Uncooked beef and pork will only keep in the refrigerator for one to two days. Meat wrapped in butcher paper should be repackaged tightly in plastic warp, foil or freezer plastic bags. Meat packaged in clear plastic warp on a plastic or Styrofoam tray doesn’t need to be repackaged. Store meat in the meat compartment or coldest part of your refrigerator. If you don’t plan to cook your ribs immediately, it is best to store them in the freezer. In the freezer, pork will keep for one to three months and beef for three to four months. When you are ready to thaw your frozen ribs, follow these simple directions. Place frozen meat in a baking dish with sides or in a resealable plastic bag to catch any drips during thawing. Place in the refrigerator and allow to thaw slowly. Never thaw on the countertop because bacteria thrive at room temperature. Leftover cooked ribs can be stored in the refrigerator for three to four days or in the freezer for two to three months. Now that you know how to cook beef and pork ribs and the differences between the cuts, you always have a delicious way to turn a relatively inexpensive piece of meat into a five-star dinner!